Local community partners range from local officials, parents and faith leaders to small businesses and they are vital to our efforts of improving low-performing schools across North Carolina. As we address the challenges and barriers to student success, we look to partner with community groups to build a strong network of education advocates. The Innovative School District (ISD) recognizes the importance of parent and family engagement in the pursuit of the highest levels of achievement for every child. The partnership between parents, families and schools is a critical component for student success. We recognize the role of parents and families as the first and most influential educators in a student’s life. The NC Department of Public Instruction works in partnership with the ISD and the operators to oversee the transfer of selected schools. The Public Schools of Robeson County have partnered with us throughout the planning phase and in the transition of Southside-Ashpole to the new operator. We are working closely with the Robeson County School Board on services including facility maintenance, child nutrition, transportation and more. Through a grant, IBM, a global technology company, led ISD leaders in an intensive workshop to concept and develop the organization’s long-term strategic plan. Development of a Four-Year Evaluation Plan that captures both external (e.g., North Carolina General Assembly, School District, Community, etc.) and internal (ISD, NC Department of Public Instruction) formative and summative evaluation needs. SchoolWorks is an education consulting company. Their mission is to build the capacity of educators to advance all aspects of student achievement and well-being. The ISD contracts with SchoolWorks to develop and conduct an independent evaluation process for prospective Innovative School Operators (ISOs). The comprehensive and transparent evaluations provided by SchoolWorks help the ISD superintendent to make informed decisions on operator selection and making recommendations to the NC State Board of Education for approval. SchoolWorks is also a partner in a continuous improvement effort to revise, improve and/or streamline the application and evaluation processes as necessary. Interested in becoming a partner? 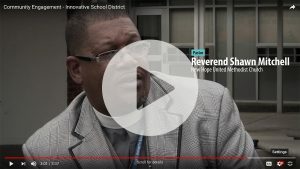 The North Carolina Innovative School District is building a network of partners from community groups, nonprofits and local companies, to research institutions and education advocates. We want to hear from you. Interested partners should contact us.